I’m Aksel Kibar. And I’m glad you’re here. I’m a Chartered Market Technician (CMT) with over 15 years experience as a classical chart trader and global equity market analyst. I’m consumed with researching and analyzing equities markets worldwide. I’m also an educator. I want investors and traders like you to use my analysis on worldwide chart patterns to enjoy the rewards of successful trading. In the Aksel Kibar’s Tech Charts Membership, you will have access to my analyses on patterns I’ve noticed through hours of research. You use the timely, actionable information with your own investing method to reap the benefits. In 2011, as part of the promotion for my book, “Diary of a Professional Commodity Trader,” I was introduced to the crazy world of Twitter. That summer, I started noticing charts of global equities that were marked up and labeled exactly how I would have done – it was as if I was viewing my own chart analysis. I had to find out who was posting these charts! It was Aksel Kibar. I had to meet this guy and eventually, we did meet, thus starting a friendship with a fellow chartist. I have the highest degree of respect for and trust in Aksel. We’ve had many conversations during the past six years – including his trip to visit me in Colorado Springs, where he presented his approach to classical charting to a group of 25 or so very well-known and respected traders. When you become a Premium Member of Global Equities Service, you’ll have exclusive access to every substantial analysis that Aksel shares. Please consider the follow, do any apply to you? Have your own investing techniques? Still tinker with your investing method or style? Have problems getting steady, reliable information on global equities? Get frustrated because you can’t trust your analyst to be consistent? Frequently miss the boat on life-altering trades? Want actionable advice – with no gimmicks, wild promises, or guarantees? Want to be on top of what’s current – and sometimes even ahead of the curve? Want information that you can use regardless of your investing style or method? Or maybe—just maybe—you’re simply looking for more… something bigger. The important trading points of each chart. Best of all, your access fee will never increases. Liberty Interactive Corp is heavily into video and digital commerce. 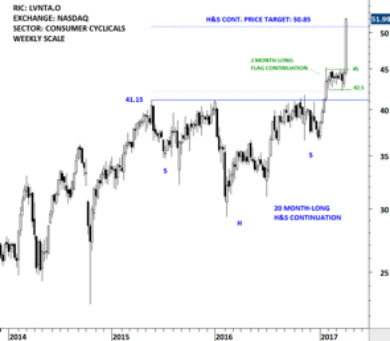 In this January 21, 2017, Watchlist Mention, the stock price had formed a 20-month H&S continuation chart pattern with strong horizontal resistance at 41.15. 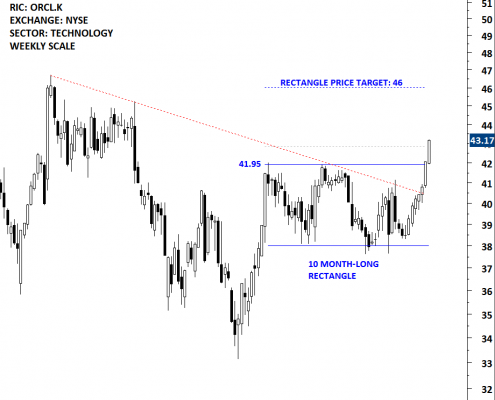 The chart pattern price indicated a target at 50.85. It was concluded that a daily close above 42.40 would confirm the breakout and push the stock to all time highs. As you can see below, a week later, the Liberty Interactive stock had a strong breakout above 41.15 levels, surpassing the indicated 42.40 from a week earlier. 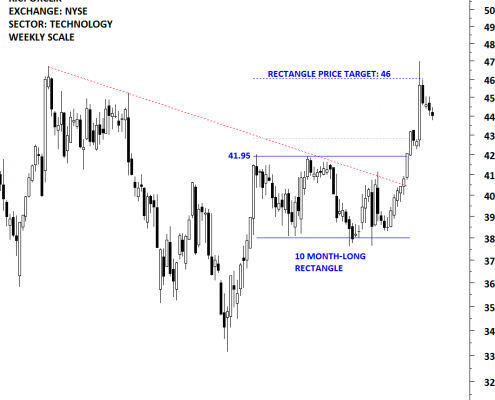 It also strongly suggested that the stock would continue towards the chart pattern price target at 50.85. Oracle Corporation (Oracle) provides products and services that address all aspects of corporate information technology (IT) environments, including application, platform and infrastructure. On February 25, 2017, Tech Charts stated that Oracle had completed a 10 month-long rectangle with a close above 42.85. 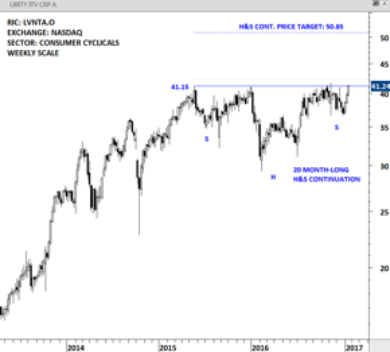 With a strong weekly scale close, the outlook became brighter, and the chart pattern indicated a price target that would reach 46. As the graph below shows, Oracle hit above 46 within a month of the February 25 alert. For more than fifteen years, I’ve followed and analyzed patterns like these time and time again. 1. Every week, you’ll receive the Global Equities Report. It will cover classical charting as we look for bullish setups that could be traded when certain breakouts occur. 2. Access to premium content as it becomes available on the TechCharts website. 3. Video tutorials showing how various chart patterns form, develop, break out, and even sometimes fail. 4. You’ll watch me point out patterns as they emerge and how I would take advantage. 5. Watchlist updates as promising patterns develop. 6. A sharper ability to identify patterns yourself: which formations are candidates for breakouts (i.e., buying opportunities) – and which ones are not. 7. Breakout Alerts when opportunities that demand immediate attention pop up. 8. An ever expanding collection of videos. You’ll have access to video tutorials to help you understand 8 of the most common charting principles. You’ll learn how they form, how to trade them, how to manage risk, and when to exit a trade. 9. Access to webinars with updated content, principles, and actionable advice. I highly recommend the research from TechCharts by Aksel Kibar. He is a classically trained chartist who sees markets as I do. He focuses on global equity markets and his research is a highly rewarding resource if you trade single stocks globally. Week in and week out, I am always amazed Aksel Kibar’s ability to come up with unique setups and opportunities from all over the world. 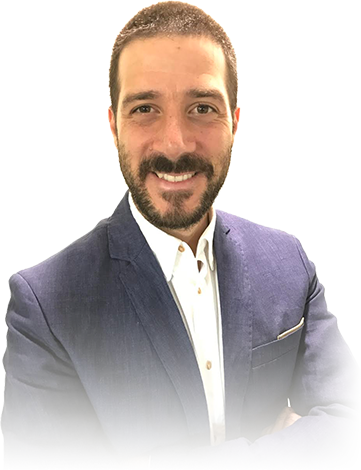 His clarity when it comes to classical charting principles is second to none, and his chart illustrations are always clean, precise, and, most importantly, actionable. I cannot recommend Aksel’s service enough. The insights and ideas of Aksel have been among my favorite readings for 2 years now. As a part-time trader, I put very high value on his down-to-Earth, calm, clear approach to the global markets. His clear communication of potential trade opportunities on the weekly timeframe has helped me greatly and would benefit anyone to retain a trading edge in nowadays markets. I cannot recommend his work enough. It was the darkest days of a bear market in 2001 when I first met Aksel. He in his early 20s and at the very beginning of his brilliant professional career. We co-worked for Turkish bank Yapi Kredi. He has been an avid learner and a strong believer in technical analysis. Over the years, he has developed his skills in technical analysis and trading. I am pleased to see him continuing down the path that he has embarked on and now sharing that knowledge and experience with aspiring traders and analysts. As a banker and also as an investor, I have followed various technical analysts over the last few decades. Aksel’s work has always stood out and helped me on multiple occasions in taking timely decisions. His consistently unbiased approach to various asset classes reflects his true passion for identifying opportunities. Aksel Kibar is one of the best classical chartists. I believe that all chart pattern traders should follow his service. As a trader, I’m always looking to learn more about trading and to get more ideas. This services is a wonderful way to do just that. In 2016, I made a life-changing decision that you can benefit from. For more than 15 years, I did analysis for banks and private investment groups. It helped me develop and hone my own systematic investing approach. But I wasn’t doing what I wanted – educating others. So… at the beginning of 2017, I started out on my own. I now can more directly help and educate investors like you. That’s why I created the Tech Charts Membership. You need actionable advice that’s accurate, timely, and yours to use as you see fit. This could be what you’re looking for. For around a dollar a day— you get access to everything as a Premium Member of the Tech Charts Membership. It’s only $465—for one full year or $145 per quarter. I believe a $465 access fee to everything I share for the next 12 months is a win-win for both of us. For you, this Premium Member fee will never increase as long as you renew your membership each year. And everything you have exclusive access to can be used however you see fit. For me, I get to continue studying markets and sharing analyses. I also get to continue educating and helping investors like you. Every successful trader and investor ever has had to rely on accurate, timely, and actionable information. Some investors like to analyze on their own and do everything their way. But most traders and investors don’t have time for it or don’t like doing it. Many other traders and investors don’t know how to do it. Either way, as a Tech Charts Founding Member, you’ll get information you can study, learn from, apply, use, or all of the above. Do you make stock picks, Aksel? No, I don’t. I will however provide hundreds of charts showing potential breakout patterns that you could consider taking advantage of. No, I don’t. I’m not a broker or seer. I simply evaluate 1000s of opportunities worldwide every day and then share my analysis. From there, you take my information and apply it to your style or method. Do I have access to archived reports? As a Founding Member, yes you do. No. I guarantee that you will receive actionable, accurate, reliable data every week. Do you have a video series? Yes, and more videos are being planned, created, and produced as we speak. They are being planned and will be made available to Founding Members.